Nejc trained at the famous stud farm Lipica, the National Lipizzaner stud of Slovenia where he was taught by George Val of the Spanish Riding School of Vienna and learned to perform the haute ecole movements levade, courbette capriole as well as all the most advanced ground movements. 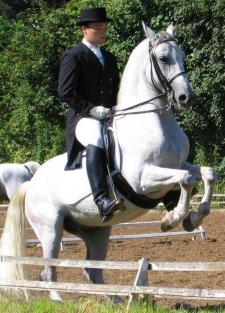 An immensely talented horseman and trainer, Nejc`s experience is not limited to high school dressage. He has worked with horses and riders at all levels and has trained carriage horses to world class level. He currently has two horses in training in the UK, an Andalusian, Beato and a young Lippizanner stallion, Zen. Nejc is now available for lessons on a Monday morning, however these lessons will need to be booked in advance. Please call the office on 01752 837000 to book a time slot. Due to Nejc's demand, all lessons must be pre paid and this is only refundable if, after cancellation your time slot can be filled.